A Toyota truck is the kind of pickup truck you can rely on to get tons of cargo safely through whatever stands in your way. Trucks like the Toyota Tacoma and Toyota Tundra have the kind of capabilities and design that give you the confidence to get up and over all kinds of terrain—and look great while doing it. Which of these two trucks is right for you? Andy Mohr Toyota helps drivers near Indianapolis, Avon, and Plainfield decide with this 2019 Toyota Tacoma vs. Tundra comparison! 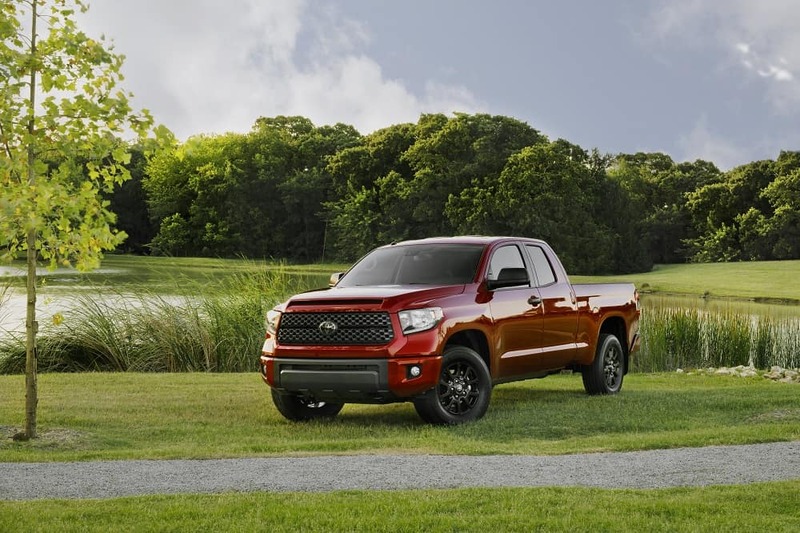 Both the 2019 Toyota Tacoma and Toyota Tundra blend sleek design with a rugged approach. Each one greets you with an intimidating black mesh grille that’s bordered by sleek diagonal headlights. The Toyota Tacoma is the smaller of the two pickups, but it offers bold features. For example, the TRD trim swaps out the iconic bull logo and displays the brand name right on the front of your truck. The 2019 Toyota Tundra tweaks this design a little bit. Above its grille there’s a wide, rectangular air intake that runs along the front of the hood. It also gives you the option to swap out the black mesh grille for a set of stylish chrome bars. 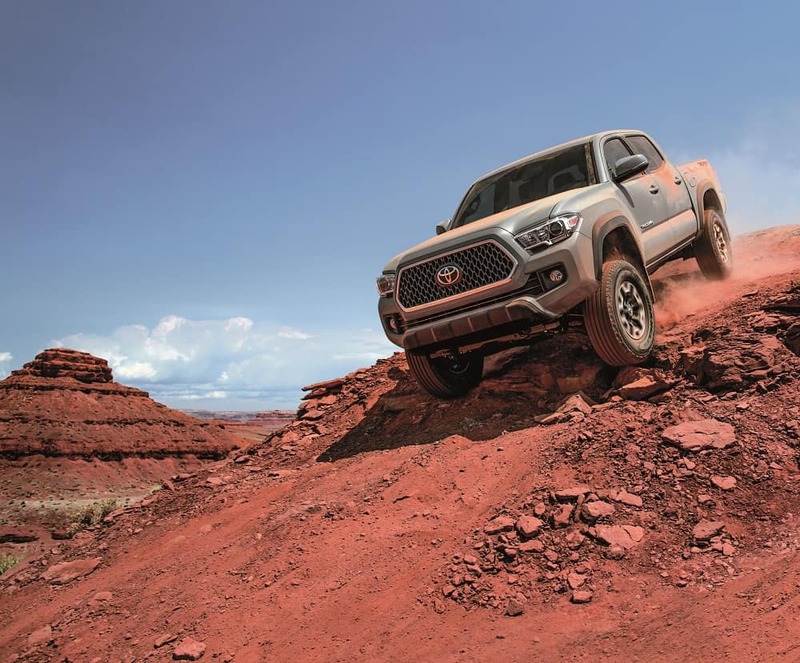 The 2019 Toyota Tacoma was built to conquer the outdoors, and this is especially true for the versatile TRD trim. It sits on durable Bilstein® shocks and a TRD-tuned off-road suspension. The TRD Pro trim takes your truck even higher with 2.5-inch FOX® Internal Bypass coils and rear reservoir shocks. If you encounter larger obstacles, you can drive over them with confidence. A ¼-inch aluminum skid plate keeps the underside of your truck safe, and with Crawl Control and Hill Start Assist, you’ll be able to attack steep angles with ease. You can even adjust your drivetrain between five low gear modes by turning the Multi-Terrain Select dial on your center console. The Toyota Tundra also offers both Bilstein and FOX® shocks, but it sits on an independent coil-spring suspension with shock absorbers and a stabilizer bar. This car also focuses heavily on towing. While both pickups feature Trailer Sway Control, the Toyota Tundra adds extra features to make towing easier and safer. For example, it’s equipped with Tow/Haul Mode and uses an Integrated Trailer Brake Controller to keep your cargo under control. Visit Andy Mohr Toyota to test drive the Toyota Tacoma and Toyota Tundra. Both of these capable and comfortable pickups provide truck lovers near Indianapolis, Avon, and Plainfield with a stylish, dependable ride. To learn more about this 2019 Toyota Tacoma vs. Tundra comparison, contact us or visit our Toyota dealership today!